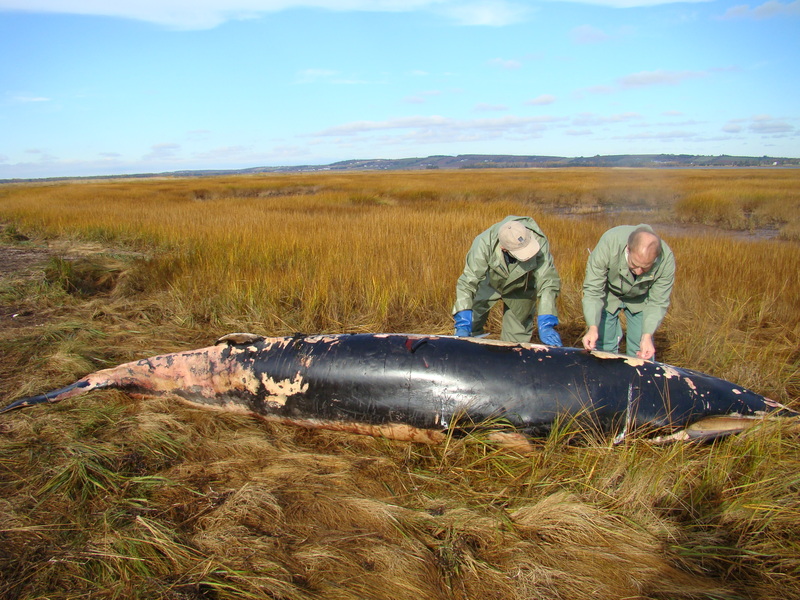 On June 16, following a day and night of very strong wind and heavy surf, a dead minke whale was found on the north shore of Prince Edward Island. A complete necropsy was done, and the whole skeleton was saved for potential assembly later on. The whale was a female, 6.3 m long; its inactive ovaries and relatively small size suggested that it was an older immature animal or a young adult. The carcass was fresh and appeared in good nutritional condition, and the gastric compartments were filled with digested food. A deep cut surrounded the base of the tail suggesting that this whale may have been caught in fishing gears and subsequently drowned. Since 1988, our Wildlife group has done the necropsy of seven other minke whales: six adult females and one immature male. Three of these seven animals had become entangled in fishing gears from lobster traps, and observations on two others also suggested that they had been caught in fishing gears. Study in Nova Scotia shows that coyotes stay close to people.